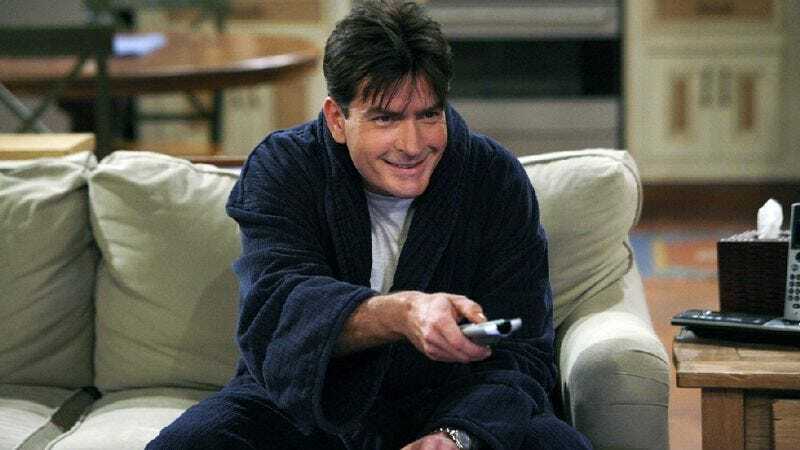 Charlie Sheen’s recent exhortations of “Bring it” have prompted a subsequent riposte of “Oh, it’s already been brought-en” by Two And A Half Men producers, who have announced that the show will officially resume bringing laughter to the nation’s hospital waiting rooms next week. Everything will be fine now. But Alcoholics Anonymous, Thomas Jefferson, his crybaby critics—these are all just background players. Sheen reserves some of his harshest, most specific invective for Two And A Half Men creator Chuck Lorre, whom he calls a “clown” and a "turd," and adds that his real name is “Hymie Levine.” [EDIT: Despite what TMZ and other sources are reporting, it sounds upon closer listening like "Chaim Levine." Lorre’s real name is listed as Charles Michael Levine.] Sheen scoffs that he “embarrassed [Lorre] in front of his children and the world by healing at a pace that this un-evolved mind cannot process,” and adds, “I’ve spent, I think, close to the last decade, I don’t know, effortlessly and magically converting your tin cans into pure gold. And the gratitude I get is this charlatan chose not to do his job, which is to write.” So, that might prove awkward come next Friday. There’s lots more stuff in the full audio here, including a few comments on Major League 3, some inside-joking over the idea that Sheen and Jones secretly work as assassins for the Pope, and some details about Sheen’s new tattoo, which somehow combines the U.S. Airborne’s “Death From Above” banner and the apple from Shel Silverstein’s The Giving Tree. “There’s my life," Sheen says of his tattoo. "Deal with it! ‘Oh wait, can’t process it.’ Losers. Winning! Buh-bye!” And hey, if you have a problem with any of this, well, you can find Sheen “hang[ing] out with these two smooookin’ hotties,” with whom he will “fly privately around the world” while you sit there "touching yourself." Sheen then wraps up by issuing a universal “bring it” to all those who, having been thus fairly warned, would still dare to criticize him. Anyway, new episodes of Two And A Half Men, everyone.